Tickets are available in advance at the GWC theater box office by phone or in person. Tickets can also be purchased online at www.gwctheater.com. The box office phone number is 714-895-8150 and the tickets are $ 15 general; $ 13 ASB GWC, Seniors, and Full-time Students with ID. We recommend buying the tickets in advance because seating is limited. The GWC dance department has brought together the talents of faculty, students and guest dancers in a concert that promises to move you to the beat of the music and the heartbeat of the dance. Many styles and genre of dance will be presented from modern to hip hop to jazz and ballet. The palette of styles and colors reflects the choreographers’ diverse backgrounds. Nannette Brodie is the director of the concert and brings both new works for the GWC students as well as reconstructions of earlier choreographies. All the students of dance at GWC will participate in this concert starting with beginning modern dancers through advanced ballet dancers. As guest performers in the concert, we have invited High School Dance ensembles from Pacifica High School in Garden Grove, Cabrillo High School and Renaissance High School in Long Beach and Nordhoff High School in Ojai. For the Nordhoff Dancers Ms. Brodie has reconstructed her Misadventures of Madeline, based on the stories and characters from the Madeline children’s books. For her GWC Modern Ensemble she has prepared an early work that is in character style reminiscent of the 1890’s called Picture Postcards. From the repertoire of Nannette Brodie Dance Theatre will be some favorites like an excerpt from Vientos de Andalucia, the Light Dance, and other works. Faculty member, Kelly Ray, will debut her dance called Loveletters for 5 GWC Production dancers to music by Nat King Cole. The GWC choreography students have been preparing their work since February. Making their debut as new or returning choreographers this year are Anneliese Rodriguez, Josh Merrifield, Lydia Brant, Alex Le, Kat Ta, Annie Weis, and Kevin Rivera. Their work is charming and full of the passion of new choreographers. 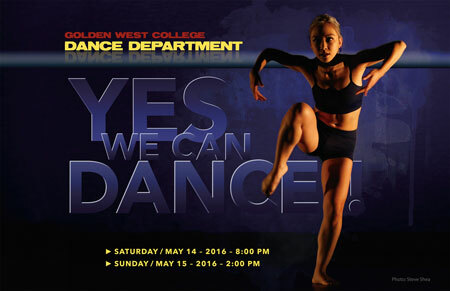 Join us again this May for the tasty dance treats from Golden West College’s Dance Department in YES! WE CAN DANCE. It will most certainly MOVE YOU.